Sometimes, you just can't beat those good old, classic combinations. Take ham and cheese: it's one of those marriages made in culinary heaven, and although the pair can be teamed in a number of ways, the croque monsieur must surely be the king of them all. This one is a true Parisian version: salty slices of ham with a sumptuous, oozing Gruyère bechamel, with a little mustard in the mix to add a lovely, sharp tang. All this loveliness is sandwiched between slices of buttery bread, fried to retain to retain the all-important crunch. Sure, you could toast them, but for proper indulgence, you shouldn't wimp out. You should use butter, too, which imbues the bread with a slightly nutty taste. Eat your croque hot and bubbling, to best appreciate its rich, molten centre. Butter all four slices of bread with half the butter and place them on a chopping board with the buttery sides down. Melt the remaining butter in a small saucepan over a medium heat and add the flour. Stir them together until they are blended, then add the milk gradually until the mixture has become smooth and thick enough to spread. Remove the saucepan from the heat and stir in the egg yolk, the mustard and the grated Gruyère, then beat the sauce until the cheese has melted. Spread the Gruyère mixture over 2 unbuttered sides of the bread. 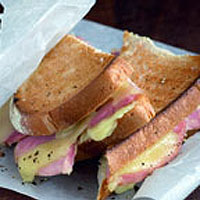 Fold 2 slices of ham and place onto one of the cheese-topped slices; repeat with the other slices of ham and the remaining cheesy slice of bread. Take the other slices of bread and place one on each of the cheese-and-ham-topped slices. Press them down lightly. Heat a frying pan over a medium heat and cook the sandwiches for 3 minutes on each side until they have turned golden and crisp. Remove them from the pan, cut into diagonal halves and serve immediately.